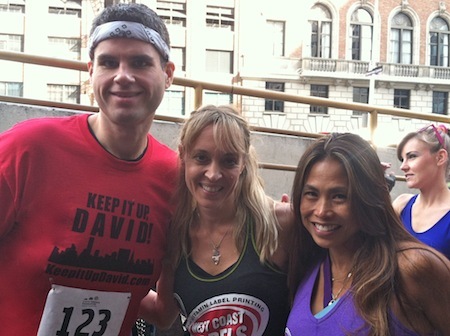 Race Recap: 2013 CF Climb | Keep It Up, David! 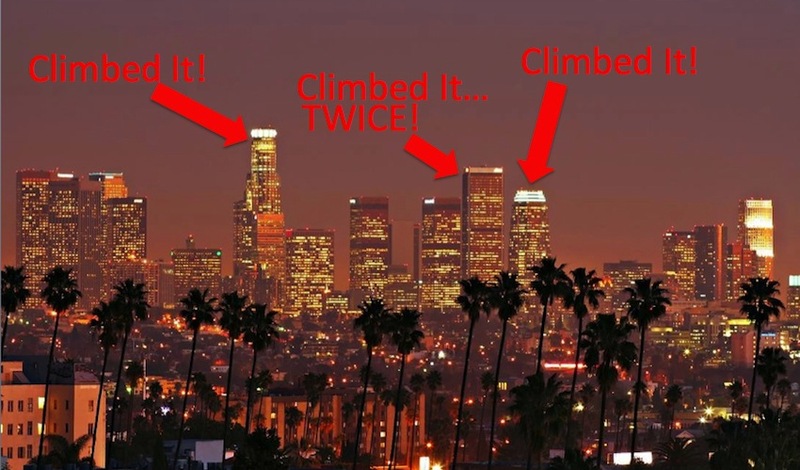 While it’s certainly impressive, and a notable feature on the Los Angeles skyline, the Figueroa at Wilshire is no record breaker, and never has been. 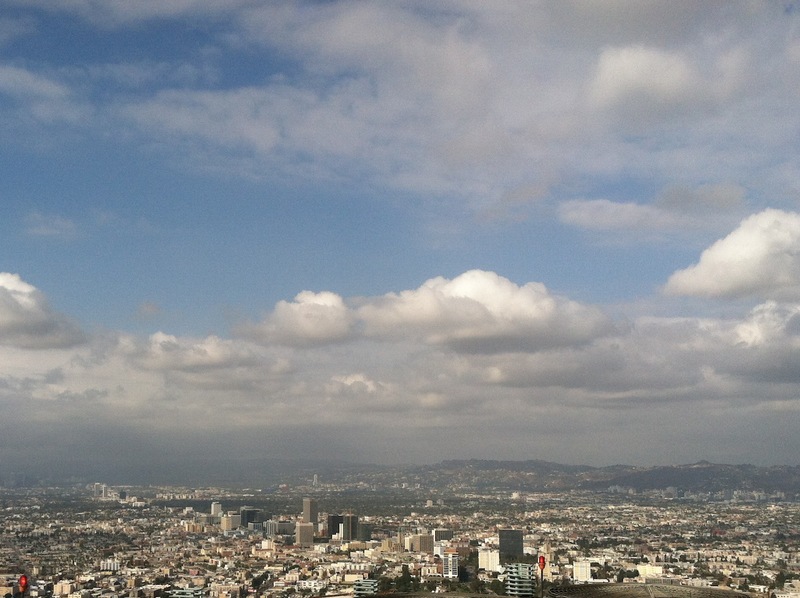 At 717 feet, the Figueroa at Wilshire is the 8th tallest in Los Angeles, the 10th tallest in California, and, depending on where you look, either the 96th or 107th tallest in the country. Despite all this, it’s still a formidable challenge to race up the building’s 54 stories in a stairwell. And it’s because the building isn’t the tallest that I gave myself a goal time to beat. Normally, making it to the top of a skyscraper without stopping is goal enough for me, because they are brutally difficult races. 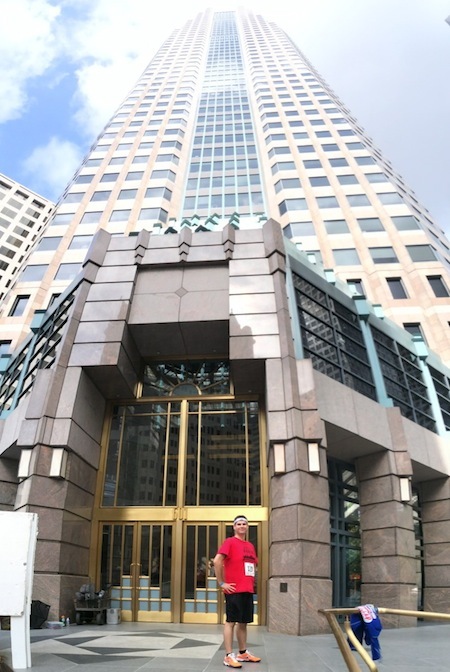 But I was up for a bigger challenge, so I calculated my average seconds-per-floor pace from my previous races, and based on those, set a goal to climb a floor in this building every 15.5 seconds. With that pace, it would take 13 min., 57 sec. to reach the roof. So I made that my goal. And a stranger took this photo of me and my bib – good ol’ lucky number 123! Once I got in the building, I felt at ease. The nerves went away and I just climbed. I started by doing as many floors as I could taking the steps two at a time. That lasted about 10 or 11 floors, and then I switched to a system where I was climbing every 4th flight two steps at a time. That system provided me a burst of energy every time I started feeling myself slow down, which was helpful. I had the same feelings of utter exhaustion and complete misery that I’ve had during every stair race, but this time around, I powered through them quicker and more easily. I focused on my footwork and making efficient turns on the landings. I tried to use the handrails to my advantage. 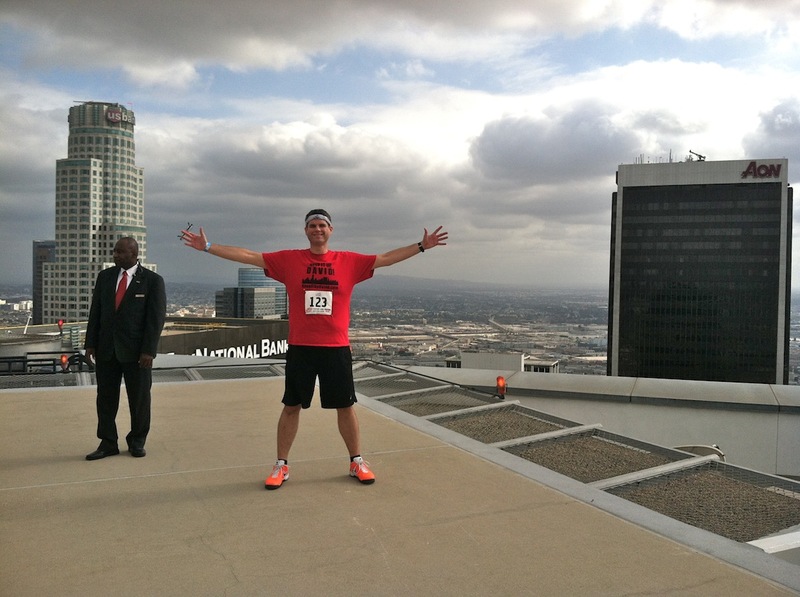 I gave it everything I had, and before I knew it, I was standing on the helipad… ON THE ROOF! When I crossed that finish line, it felt like my heart was going to burst from my chest, from both the overwhelming sense of accomplishment and the excruciating physical exertion. If there’s one thing my previous climbs taught me, it’s that going 100% during a stair climb race results in what I imagine a heart attack would feel like! TWELVE MINUTES, TEN SECONDS! Holy cow! I beat my goal time by 1 minute, 47 seconds! I ended up finishing 13th among Men 30-39, and 58th among all runners, but that time is what’s important to me. That’s the result of hard work, my friends! **UPDATE! ** According to revised official results, I finished 15th among Men 30-39, 51st among all men, and 62nd among 239 total runners! Best of all, I set an ALL-TIME PERSONAL RECORD for my pace per floor! 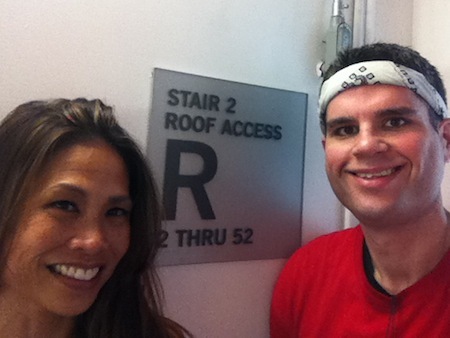 During my very first race, in the AON Center, my pace was 14.6 seconds per floor. A year later, in that same building, I slowed down to 16.5. 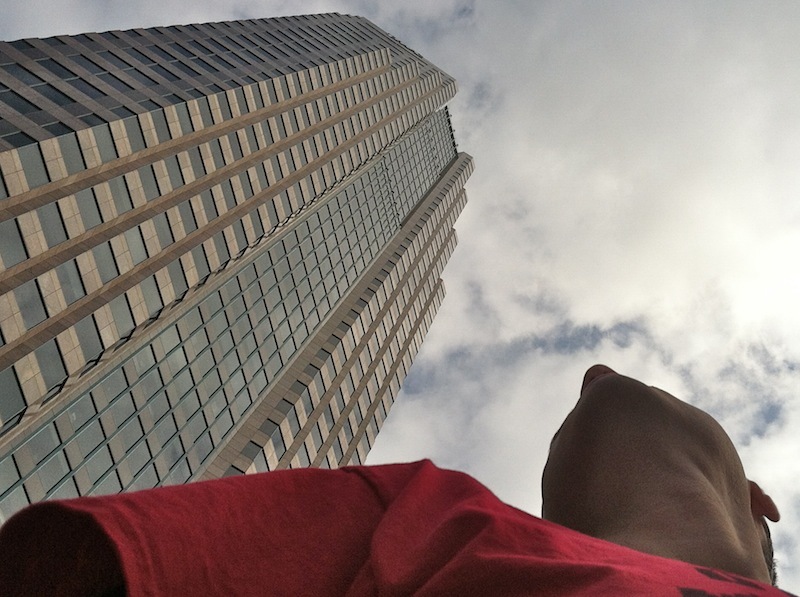 In the US Bank Tower, I averaged 16.4. 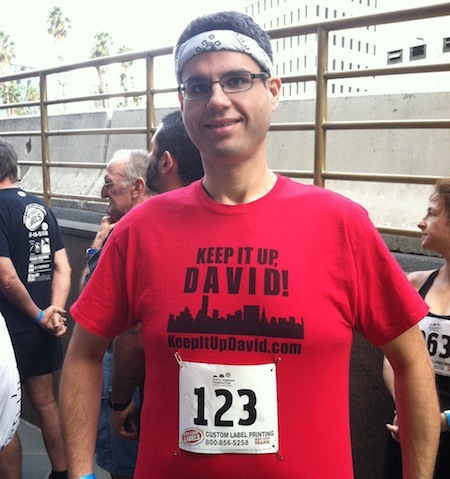 My pace during this race was 13.5 – I beat my previous best pace by OVER A SECOND! 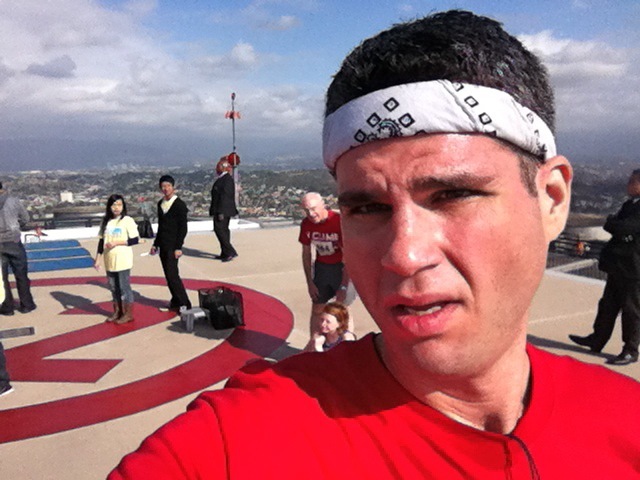 But we made it to the roof… a SECOND TIME! For those keeping track (like me), that’s 108 stories that I climbed! I also got some pointers during the climb from the ladies on posture, how to better use the handrails to help me, and how to cut down on time spent making turns on the landings. This was all valuable information to a relative new stair climber like me. 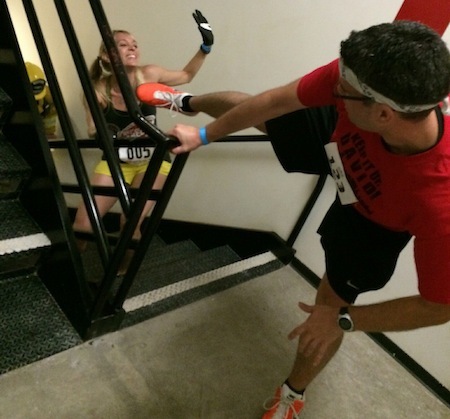 Another stair climbing friend suggested that with some changes to my form, I could easily shave a minute off my times. Looks like I have some work in front of me! We got back down to the plaza just in time for Veronica and Madeleine to get their medals during the awards ceremony. Then, Madeleine took this awesome photo of me and the building I conquered… twice! That picture gives me goosebumps. In the best possible way. 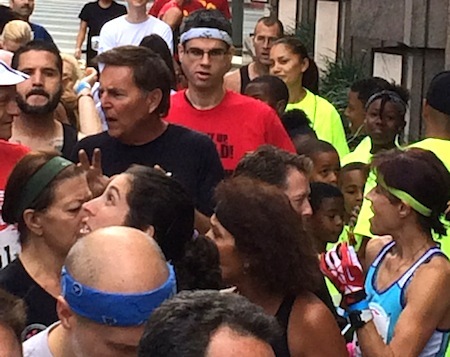 PS: I ran this race on my sister’s birthday… HAPPY BIRTHDAY, SARAH! PPS: Thanks to all the donors that made this race possible for me! I’m looking at you, Chris and Ron R., Laura G., Linnea and Robert S., Emily S., Sarah V.H., Annie and Dean F., and Joanne and Joe G! 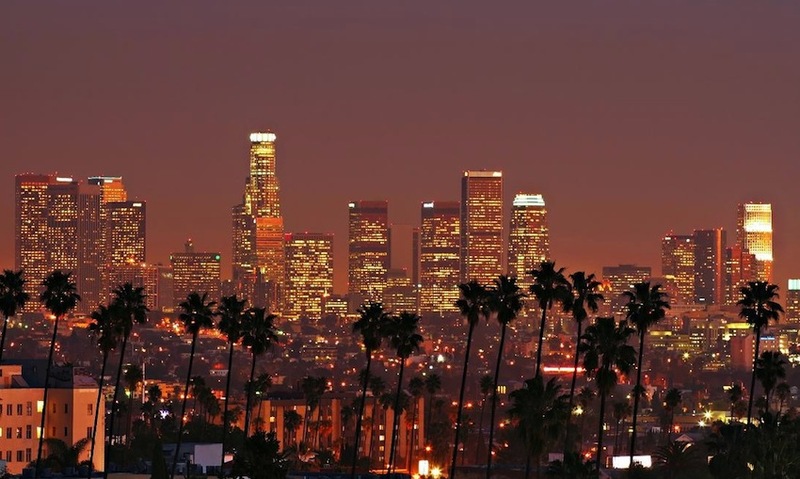 This entry was posted on Monday, November 18th, 2013 at 12:01 am and is filed under Uncategorized. You can follow any responses to this entry through the RSS 2.0 feed. You can leave a response, or trackback from your own site. Thanks Karen! Hope you’re well! I’m planning on being there! Thanks for such a great comment. I really enjoyed the photos of the “second time” It looks like you were having fun. It was a blast. Hope you’re well! Wow — doing it twice. That’s hard-core! BTW, I showed your paper weight graph pictures to my husband the other day because I find them so amazing. Sometime I’d love to hear a recap of how you got started. Thank you! I love my chart too. As you can find a good recap of how I got started right here. Fun read David! Glad you had such a great experience! Thanks, Lisa, for checking it out! Great to see you Saturday.